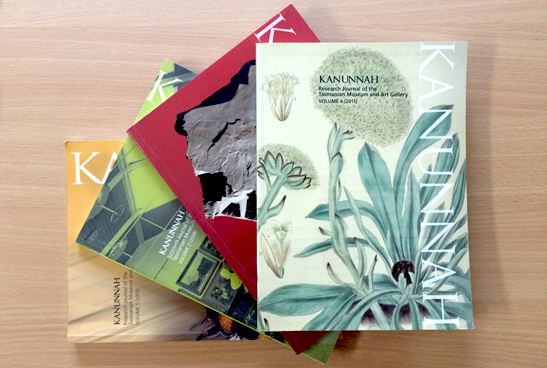 Kanunnah is the research journal for the Tasmanian Museum and Art Gallery (TMAG). The primary focus of the journal is the state of Tasmania, but papers dealing with Tasmanian, southern Australian and sub-Antarctic issues would be particularly welcome. Kanunnah provides a venue for staff at TMAG to publish on research being undertaken locally, but also provides the opportunity for interstate and overseas researchers to publish on Tasmanian themes in the in-house journal of the TMAG. All papers submitted to the journal are peer-reviewed by specialists with expertise in the appropriate areas. The aim in publishing the journal is to encourage research on collections held in TMAG. Click below to read the current edition of Kanunnah, Volume 7, via Issuu. Previous editions of Kanunnah are available to download in pdf format below.